Yesterday was the first time I actually saw the etched paving, and I must say it looks great! I really like how the etched area shows the curvy bmps of the glass chips which is a nice contrast to the smoothness of the rest of the surface. They glint beautifully in the sunlight too. There have been lots of delays and hitches with this project - sometimes useful (giving a little extra time to do some silvering), sometimes frustrating (waiting for pay day). It is the groundwork preparation that has been slow, which was completely beyond our control. I think the extended snowy winter has had something to do with it. Luckily the health and safety specification problems turned out fine. As the glass strips ae so small no information about load bearing capacity was needed afterall. 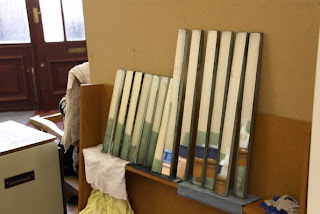 Saint Gobain Glass, who supplied the glass were extremely helpful though, and can work out load bearing specifications from a drawing. Very impressive. Anyway, now it is finally happening. We've been assembling the recycled glass slabs (supplied by Enviroglass) like a giant jigsaw, which was both fun and good for the biceps! we're on call all this week for jigsawing the next batch. Of course little hitches are still occuring. Today we found that the top section of the 'U' didn't line up with the bottom section slightly, and there was a bit of a tense moment while we decided if it was far enough out to be worth replacing. I'm a bit of a perfectionist and was in the yes camp, but a broken slab meant we were ordering another one anyway so that was the clincher. We're re-etching the misaligned U. The railway public art project is being installed! see the project's own blog for a full pictorial archive. Silvering the glass strips that are to be inserted between etched paving slabs proved a little tricky. In the end, it was the rather low temperature of my studio (10 degrees C) that was the problem. A cosy 21 degrees was needed to make the chemical reactions work. A god excuse to whack up the heating! 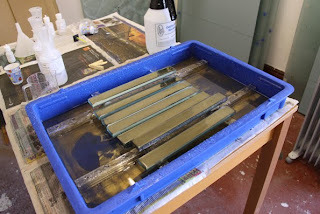 Angel Gilding supplied the silvering kit - it came all the way from the USA! I could seriously get into this silvering idea. Attempting to silver very thin strips with not much in the way of time or materials to spare was rather stressful but it worked out ok. Square foot coverage of several thin strips is not the same as if they were all one sheet though, so I got through a lot of chemicals! It was fun though, and now they're being cemented in place as I type. The long thin strips are silvered on 2 sides then embedded in the ground with only 1 clear edge visible. The intention is that the light enters and bounces around giving little strips of luminosity and depth in amongst recycled glass paving etched with signage text and a poem.